Life is governed by a complex and tightly regulated sequence of biochemical reactions, catalyzed by enzymes. Characterizing enzyme activity is extremely important both to understand biological processes and to develop new industrial applications. 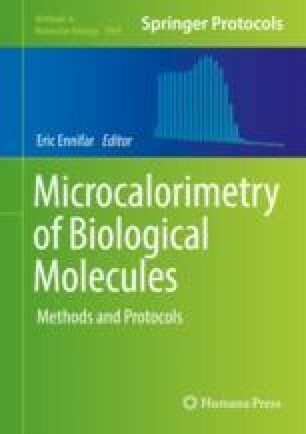 Calorimetry represents an ideal system to measure kinetics of biochemical transformations, because it uses heat, always produced or absorbed during chemical reactions, as a probe. The following protocol describes the details of experimental setup and data analysis of isothermal titration calorimetry (ITC) experiments aimed to quantify the thermodynamic (ΔH) and kinetic (KM and kcat) parameters of enzyme catalysis. A general guideline to choose the right procedure according to the system under analysis is given, together with some instructions on how to adjust the experimental conditions for obtaining reliable data. The method to analyze the obtained raw ITC curves and to derive the kinetic parameters is described.